This code of practice is for sponsors, manufacturers, component suppliers and members of industry bodies who are involved in the design, selection and use of tamper-evident packaging for therapeutic goods. The purpose of tamper-evident packaging is to alert consumers of possible safety concerns before they purchase or use goods. This code of practice provides guidance on tamper-evident packaging for therapeutic goods. Compliance with the code improves the security of therapeutic goods supplied in Australia and increases the likelihood that consumers can identify when a product has been tampered with. The code is not mandatory, but it has been established as a condition for membership for some relevant industry associations. The Code of Practice for the Tamper-Evident Packaging (TEP) of Therapeutic Goods was originally published in June 2003 by the Therapeutic Goods Administration (TGA) after consultation with key industry associations, state health authorities and consumers. In 2009, the code was reviewed by the Therapeutic Goods Committee with consultation with relevant stakeholders; no changes to the scope or technical requirements were identified. This version of the code of practice does not introduce any new requirements for tamper-evident packaging but is an update that reflects contemporary practices. Tamper evident packaging (TEP) means packaging that has an indicator or barrier to entry which, if breached or missing, can reasonably be expected to provide visible or audible evidence to consumers that tampering may have occurred. Use the code of practice as a guide for the design, selection and validation of tamper-evident packaging. It can also be used as a reference for selecting appropriate tamper-evident labelling statements. If sponsors choose to use tamper-evident packaging for medical devices that are not available to the general public, they must use an acceptable form of packaging that will meet the essential principles relating to product safety outlined in the Therapeutic Goods (Medical Devices) Regulations 2002. Tamper evident packaging does not replace or obviate the need for child-resistant packaging where the law requires such packaging (Therapeutic Goods Order No. 80). If child-resistant packaging is required, then use tamper evident packaging in conjunction with child-resistant packaging. Tamper-evident features are barriers or devices on the packaging, which if breached or missing, reveal irreversibly to consumers that tampering may have occurred. The features can be used on primary packaging, the container or both. Examples of acceptable forms of tamper-evident features are described below. Other forms of tamper-evident packaging may also be acceptable, provided they are appropriate for the product and suitably validated. The feature used must be appropriate for the product in question and validated in accordance with design and validation principles. In selecting a tamper-evident feature, consider the special needs of some consumers, such as arthritic, manually impaired or elderly persons. A transparent film with distinctive design is wrapped securely around the entire product pack ensuring that it is completely sealed and a secure, tight fit is achieved. 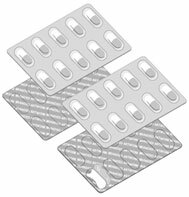 Individual doses (for example, capsules or tablets) are sealed in pockets between a pre-formed tray and a lidding material, or between two layers of material bonded together to form a continuous strip, so that the dosage units are separated and individually protected. The product and container are sealed in a plastic bubble and mounted in or on a display card. Bands or wrappers with a distinctive design are shrunk by heat to tightly seal the union of the cap and container. The product is enclosed in an individual pouch or sachet that must be ripped, peeled open or broken to gain access to the product. Paper, thermal plastic, polystyrene foam, plastic film, foil, or combinations thereof, with a distinctive design is sealed to the mouth of a container under the cap. Paper, foil or plastic with a distinctive design is sealed over all carton flaps or a container cap. The plastic or metal cap has a portion (such as a ring) that breaks away on opening and remains on the neck of the container. The plastic or metal cap has a portion that is torn away in order to allow the remainder of the cap to be removed to gain access to the product. The lower end is sealed by folding and/or crimping. The lower end of the tube is sealed by heat-sealing and crimping. The top and bottom of a can must be joined to the can walls in such a manner that they cannot be pulled apart and reassembled without visible evidence of entry. Products such as in-vitro diagnostics with in-built controls that indicate if the product is unacceptable for use (i.e. a test-method failure) are considered as having tamper-evident controls. Such products are considered to comply with the code of practice without needing additional packaging or labelling. Two-piece capsules are sealed such that the two halves of the capsule cannot be separated or re-joined without leaving visible evidence of entry. For unsealed capsules, the packaging requires two tamper-evident features. Some packaging available for use with therapeutic goods is not considered to be tamper-evident. These types of packaging may be easily breached and/or do not provide an adequate indication of likely tampering. Examples of acceptable wording for tamper-evident statements are below. Any mandatory label information must not be destroyed or obscured by the use of tamper-evident packaging. Examples of mandatory labelling requirements for therapeutic goods include Therapeutic Goods Order No. 69 – General requirements for labels for medicines, Therapeutic Goods Order No. 92 – Standard for labels of non-prescription medicines and the Poisons Standard. For sachets not for individual sale, blister or strip packs and small containers, it is acceptable for the tamper-evident packaging statement to be included only on the primary pack. Due to the potential for paper labels to be removed and/or substituted, direct printing of the statement, or full label, on the container may be more effective than a paper label. A primary pack, in relation to therapeutic goods, means the complete pack in which the goods, or the goods and their container, are to be supplied to consumers. Examples of acceptable wording are listed in the table below. Alternative wording that delivers equivalent consumer understanding is also acceptable e.g. 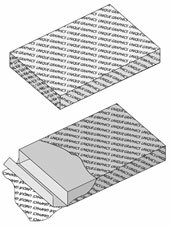 some generic statements as supplied on packaging components by packaging material manufacturers. We encourage you to use performance-based labelling principles.